MARCH is an LA Times Book Prize Finalist! 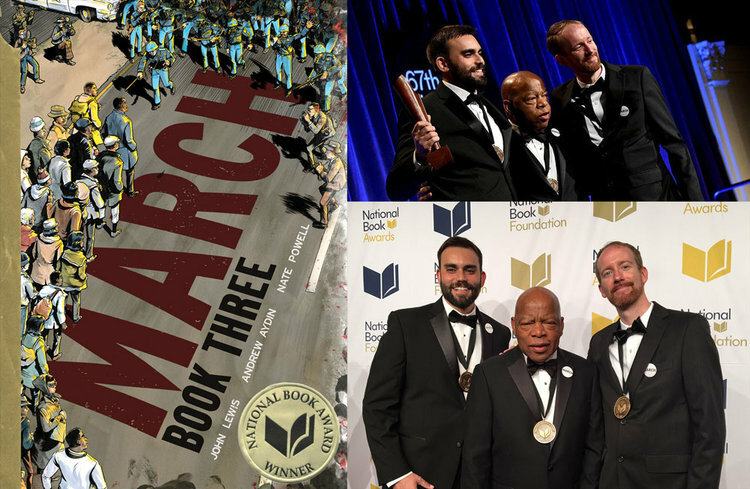 The prestigious Los Angeles Times Book Prizes announced today their list of finalists, and March: Book Three (by Congressman John Lewis, Andrew Aydin, and Nate Powell) is one of five books listed as a finalist for Young Adult Literature. This is the first LA Times nomination for the acclaimed March trilogy, which has already won the National Book Award as well as a record-breaking four major awards from the American Library Association. 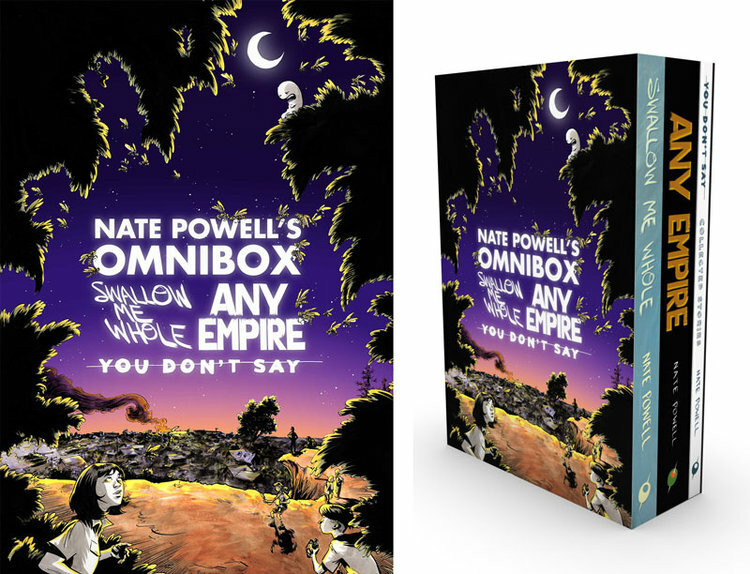 Nate Powell was previously an LA Times finalist in 2009 for his book Swallow Me Whole, also in Young Adult Literature. At the time, no graphic novel had been nominated for the prize in any category since Art Spiegelman's Maus. This year's LA Times Book Prizes will be awarded at the University of Southern California on April 21, 2017, inaugurating the LA Times Festival of Books. Tickets to the ceremony will be on sale starting March 16. For more information, visit http://events.latimes.com/festivalofbooks/book-prizes/. and the YALSA Award for Excellence in Nonfiction for Young Adults. 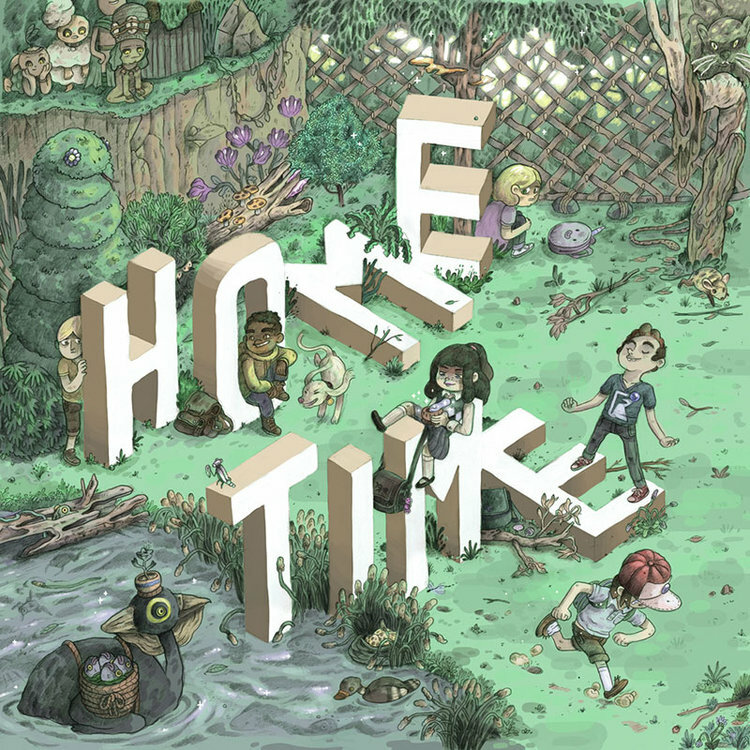 These honors for March: Book Three follow closely on the heels of the National Book Award for Young People's Literature and the Walter Dean Myers Award for Outstanding Children’s Literature – Young Adult Category, making it the first book to win both the Printz and the National Book Award. "I'm delighted and honored that America's librarians are supporting March with these awards," said Congressman Lewis. "I love books and I love librarians. When I was growing up I tried to read every single thing I could. I hope these awards will help inspire all of our young people — and some of us not so young — to read, to learn, and to act. March is a guidebook reminding us that we all must speak up and stand up for what is right, what is fair, and what is just." The March trilogy, which depicts Lewis’s firsthand account of the Civil Rights Movement, has previously won such honors as the Robert F. Kennedy Book Award, the Eisner Award, two Harvey Awards, and a Coretta Scott King Author Honor. It is rapidly being adopted by universities and public school systems from New York to San Francisco, and recently spent six continuous weeks holding the top 3 spots on the New York Times Bestseller List. Congressman Lewis accepted the YALSA Nonfiction Award on behalf of the three creators today at the ALA Midwinter Conference in Atlanta. The King, Printz, and Sibert Awards will be handed out in ceremonies at the ALA Annual Conference in June. The groundbreaking March trilogy reached another milestone this week, as the organization We Need Diverse Books declared it the winner of their second annual Walter Dean Myers Award for Outstanding Children’s Literature – Young Adult Category. 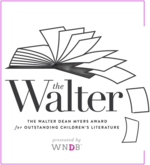 March: Book Three was declared the winner of "The Walter," which is named in memory of children’s and young adult author Walter Dean Myers (1937-2014) and celebrates diversity in teen literature. Three honor books were also named: Watched by Marina Budhos, If I Was Your Girl by Meredith Russo, and The Sun Is Also a Star by Nicola Yoon. A ceremony honoring the winners will take place at the Library of Congress in Washington, D.C., on March 31, 2017. WNDB will donate a minimum of 2,000 copies of the 2017 Walter Award winner, March: Book Three, across the United States to schools with limited budgets. For more information, visit www.weneeddiversebooks.org. Jealousy is an art — in James Albon's HER BARK & HER BITE! This month's Diamond Previews catalog features an unfamiliar name: James Albon. He's a titanically talented young British artist living in France, and we can't wait to bring you his haunting beautiful debut graphic novel. Her Bark and Her Bite follows an ambitious painter named Rebecca as she meets a man who seems to be the life of every party. He makes her feel like a million bucks — until she starts to suspect he's emotionally bankrupt. Check out a preview of James Albon's stunning colored-pencil page layouts, and pre-order now for release in April 2017! New CHESTER 5000 from Jess Fink in stores soon! 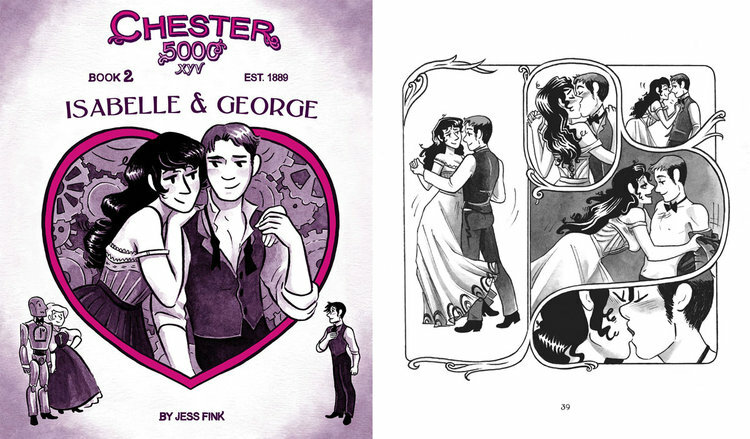 Jess Fink's adults-only webcomic Chester 5000 took the world by storm when it first appeared, with a combination of vintage charm, page-turning story hooks, steamy scenes, and robot lovin' — all without a single word of dialogue. We were delighted to collect the complete tale as a beautiful hardcover, which has become a perennial favorite and critical darling. Now, Jess returns to the world of Chester 5000 with the prequel Isabelle & George, full of even more drama, romance, and mechanical wonders. Following a smash-hit Kickstarter, she's partnered with Top Shelf once again to bring it to store shelves everywhere next month, February. Click here for more details and a 7-page preview, and grab a copy from your favorite retailer for that special someone in your life! 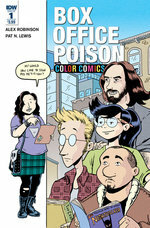 BOX OFFICE POISON returns — in full color! Alex Robinson's Box Office Poison began as a black-and-white comic book series, then grew to a massive graphic novel of over 600 pages — one of the first of Top Shelf's famous "bricks" and a smash hit that won the Eisner Award, the Angoulême International Comics Festival Award, and was eventually voted by Wizard Magazine the best independent graphic novel of all time. Now, this page-turning "slice of life" saga is reborn for a new age. Box Office Poison Color Comics #1 has just arrived in stores, launching a new version of the series with all-new colors by Pat N. Lewis and pages of commentary from Alex Robinson himself. Jump on board and fall in love with these unforgettable characters all over again — or for the first time. 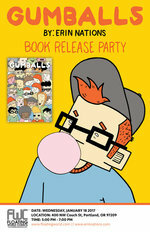 GUMBALLS Launch Party in Portland! The first issue of Erin Nations' Gumballs is out — and readers love it! 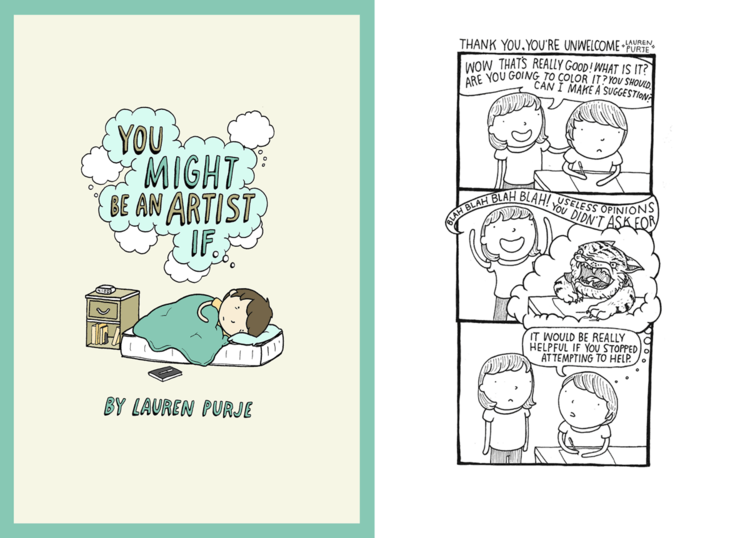 You can meet Erin, learn more about his work, and get your comics signed at Floating World Comics in Portland, Oregon next Wednesday, January 18, 2017. For details or to RSVP, see Erin's web site. The Atlanta Journal-Constitution reports that the award-winning March graphic novel trilogy is being adopted in seventh-grade English Language Arts courses across Atlanta Public Schools. The series, created by Congressman John Lewis, Andrew Aydin, and Nate Powell, has already been adopted by major public school districts such as New York City and San Francisco. Now, APS brings the bestselling story of John Lewis to schools throughout Atlanta, a landmark nexus of the civil rights movement as well as Aydin's hometown and Lewis's constituent district. Up next for March: the authors travel to New York City to accept their Finalist medals from the National Book Awards, and see whether March: Book Three will become the first graphic novel ever to win! Magic potions can be powerful stuff, but they don't always turn out like you want. 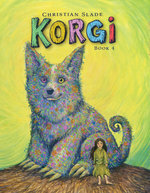 Our canine hero, Sprout the Korgi, learns this the hard way — and goes through quite the transformation — in his latest adventure! This mixed-up woodland fairy tale features Ivy's first meeting with Sprout, a surprisingly musical new trick, an undead unicorn, more of those pesky Creephogs, and at least one giant boulder. As always, the story unfolds in lovingly detailed pen-and-ink drawings. From the heart, mind, and hands of Christian Slade comes the most fantastic and creative chapter yet from the enchanting world of Korgi. In stores now — click here for a 6-page preview, and don't miss the first three Korgi adventures from Christian Slade! RETURN OF THE DAPPER MEN Comes to Top Shelf! 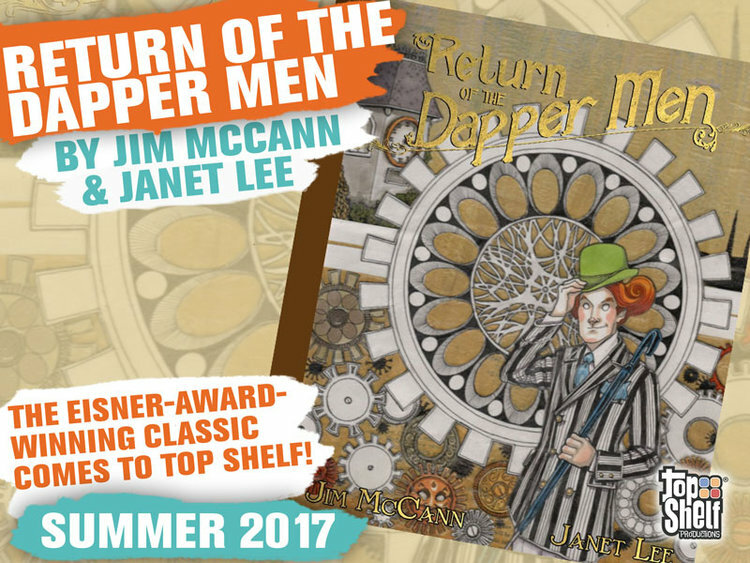 NEW YORK (October 10, 2016) — Return of the Dapper Men, the Eisner-award-winning graphic novel by Jim McCann and Janet Lee, will be republished in a deluxe new edition in summer 2017 from its new home at Top Shelf Productions, an imprint of IDW Publishing. The deal, announced yesterday at New York Comic Con, also includes the long-awaited expansion of the Dapper Men story into a trilogy. McCann and Lee reunite for an all-new sequel, Time of the Dapper Men, which will be released in summer 2018. “After seeing three disparate pieces of Janet's art one Christmas I couldn't get them out of my head," says writer Jim McCann. "In my mind they fit into a story, and that tale became the Dapper Men saga. I'm so lucky Janet said yes to taking this journey together, and now, thanks to Top Shelf/IDW, our characters get to continue their journeys in the trilogy we envisioned." McCann adds a few hints about what comes next for the world of the Dapper Men: "We will see more whimsy, more choices to be made, more challenges to overcome, lessons to learn, and of course more new characters for Janet to draw in Time of the Dapper Men. I'd tell you about the final book, but let's just say the ending of Time will have you guessing and gasping for more. And you'll get it. Finally." NEW YORK — This morning the National Book Foundation announced the finalists for the 67th Annual National Book Awards — including, for the first time since 1957, a sitting member of Congress. Congressman John Lewis, Andrew Aydin, and Nate Powell are now National Book Award finalists in the Young People’s Literature category, for the concluding volume of their bestselling graphic novel trilogy March. The autobiographical series, which depicts Lewis’s firsthand account of the Civil Rights Movement, has previously won such honors as the Robert F. Kennedy Book Award, the Eisner Award, two Harvey Awards, and a Coretta Scott King Author Honor. It is rapidly being adopted by universities and public school systems from New York to San Francisco, and recently spent six continuous weeks holding the top 3 spots on the New York Times Bestseller List. Few graphic novels have previously reached NBA Finalist status, including such acclaimed works as American Born Chinese and Boxers & Saints by Gene Luen Yang, Stitches by David Small, and Nimona by Noelle Stevenson. Other notable finalists include The Catcher in the Rye, To Kill a Mockingbird, and Profiles in Courage by Senator John F. Kennedy, who is himself a character in March. The March team will travel to New York City to join this year's other finalists for two days of festivities November 15th and 16th. For more details, visit http://www.nationalbook.org. Meet Top Shelf authors at New York Comic-Con! Plus don't miss Top Shelf's Leigh Walton on the IDW Publishing: Indie Books On The Rise panel (Sunday Oct 9, 1:30–2:30 pm in Room 1A02) for the scoop on what's next from Top Shelf — including a very exciting announcement from an Eisner-winning project!